Visit our Cookware Store for great brands at top prices. Candy makers love this double boiler. 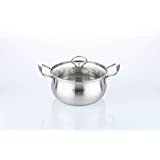 Non-reactive stainless steel allows you to whisk or stir in this 2-Quart size. the full cap base has an aluminum core for even heating and the stainless steel body offers lasting beauty. With its Full Cap Base Advantage a stainless steel protector surrounds a thicker aluminum core for easy maintenance and better heat distribution. Since the entire surface is stainless steel cleanup is easier. Enjoy a lifetime of beauty!. 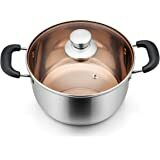 Includes double boiler insert. Full cap base advantage for superior heat distribution. Thicker rolled pan rim for extra durability enhanced drip-free pouring and easy handling. Close fitting lid creates a self-basting feature that protects food s taste and nutrients. Classically styled phenolic handles. Material: 18/10 Stainless steel. Dimensions: 8.25 H x 12.5 W x 7.75 D. Capacity: 2 Quart. Cleaning and Care: Dishwasher safe. Oven safe up to 350F. I've had my Faberware pots for many many years and they are still terrific. I intend to expand my own stock soon, as whilst they are expensive, they last and last and are worth the investment. 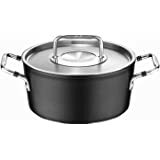 The quality and durability of this line of cookware is extremely high. I have been a farberware fan for decades. I have my grandmothers that I have been using since I inherited a set from her in 1980. I bought this to expand my collection and sadly the steel is noticeably thinner. It still works but I am wondering if it will last like my vintage farberware has. It is sad that some higher up thought that they could make more money and skimp on the level of quality, not pass that higher profit margin on to their employees but probably pay the CEO more money so he can get a bigger boat. I could go on about this being a recurring theme in most products made nowadays but I digress. 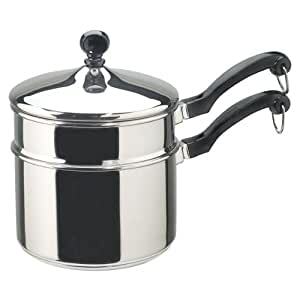 This is a very nice double boiler if you're cooking a 1 quart quantity or less. 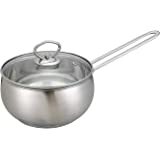 Not sure why it's labeled in a misleading way, it's even misleading on the Farberware website. 5.0 out of 5 starsExcellent for the money! 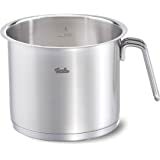 I have used this for both heating food in the bottom portion (soup) and as a double boiler, mainly for melting chocolate or heating egg whites and sugar for frostings and making ganache and I'm quite happy with the performance, considering the low price tag. As others have mentioned, there is a groove around the sidewall which allows food to settle into, but I find that it's easily removed when I use my rubber spatula (which I use to stir anyway) to just scrape along inside the groove when I scrape the sides down, it comes right out. It's not a big deal to me and I haven't had anything "cooked on" that couldn't be easily removed. I would think a short soak in hot soapy water would fix any stubborn residue. I haven't used it for gravies or floury foods though, so maybe that would be different. The bottom of the pan is a little on the thinner side, but since this is meant mainly for use as a double boiler, that matters very little, and it's not flimsy. It feels sturdy. I find that this item is well worth the money. 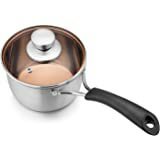 I'm not a professional chef, so I've never used expensive pots and pans and cannot offer a comparison, but I use this frequently and would buy it again based upon my experience with it. 1.0 out of 5 starsDont waste your money. Cookware flacked metal after one use Farberware is not what it used to be. They are sending a replacement but don't know how it will hold up. I had the last set of Farberware for 50 years with no problems. The larger of the two pans arrived with a loose handle that could not be tightened and my attempts to reach their customer service department failed. I do not feel the pan is safe to use.